JPMorgan Chase & Co is a multinational bank holding company that is headquartered in New York City. It became one of the top banks in the USTop Banks in the USAAccording to the US Federal Deposit Insurance Corporation, there were 6,799 FDIC-insured commercial banks in the USA as of February 2014. The country's central bank is the Federal Reserve Bank, which came into existence after the passage of the Federal Reserve Act in 1913 after the merger of J.P. Morgan and Chase Manhattan Bank in December 2000. Globally, JPMorgan Chase and Co. is the sixth largest bank by assetsFinancial AssetsFinancial assets refer to assets that arise from contractual agreements on future cash flows or from owning equity instruments of another entity. Financial instruments refer to any contract that gives rise to a financial asset to one entity and a financial liability or equity instrument to another entity in the world, with total assets amounting to $2.5 trillion. It lists $28 trillion in assets under custody and administration and employs 243,355 individuals as of December 2016. 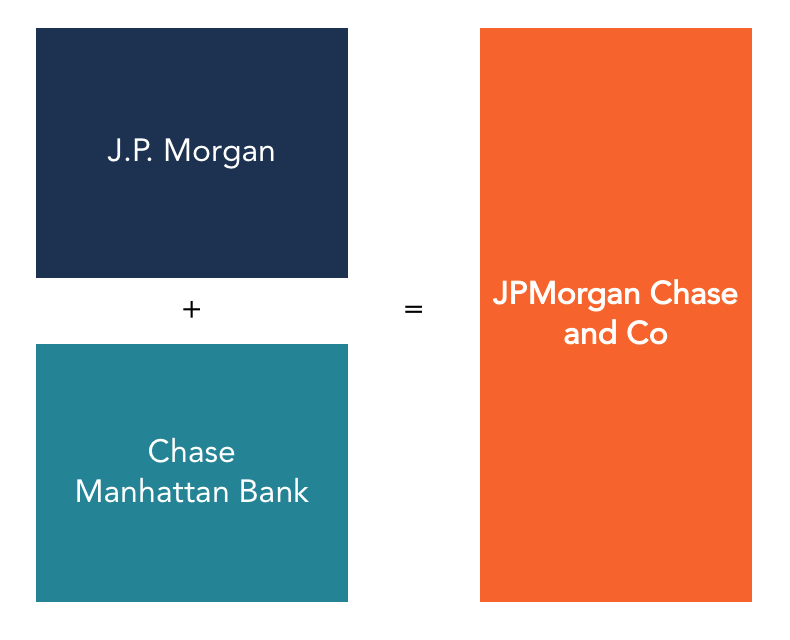 JPMorgan Chase is considered a universal bank, as well as a custodian bank, with J.P. Morgan brand and Chase Bank brands working under its wings. The J.P. Morgan brand is used by the investment banking, private bankingPrivate BankingPrivate banking involves providing personalized financial and banking services to high net worth individual clients. The bank assigns specific employees to cater to each banking client's needs. Unlike mass-market retail banking, private banking focuses on providing more personalized financial services, private wealth managementPrivate Wealth ManagementPrivate wealth management is an investment practice that involves financial planning, tax management, asset protection and other financial services for high net worth individuals (HNWI) or accredited investors. Private wealth managers create a close working relationship with wealthy clients to help build a portfolio that achieves the client’s financial goals., asset management, and treasury and securities divisions. On the other hand, the Chase Manhattan bank brand is used for commercial banking, retail banking activities in the United States, and credit card services in both the US and Canada. History of JPMorgan & Chase Co.
JPMorgan Chase & Co was founded on December 1, 2000, after the merger of JPMorgan and Chase Manhattan Bank. The combined JPMorgan Chase & Co went on to acquire Bank One Corporation in 2004, and Bear Stearns and Washington Mutual in 2008. Its oldest predecessor is the Bank of the Manhattan Company, which was established in 1799. J.P. Morgan is one of the principal subsidiaries of JPMorgan Chase & Co. It was established in 1871 as a partnership of Drexel, Morgan & Co and the name was later changed to J.P. Morgan in 1895 after the death of Drexel. It is the predecessor of some of the largest banks in the world, including JPMorgan Chase & Co, Morgan Stanley, and Deutsche Bank. J.P. Morgan was one of the most influential banks during its initial years. It financed the formation of the United States Steel Corporation and the New Haven and Hartford Railroad in 1892. Later in 1895, it supplied the US government with $62 million worth of gold to float a bond issue to meet the government’s desired surplus of $100 million. Chase Manhattan Bank was established in 1955 after Bank of the Manhattan Company purchased Chase National Bank. The Bank of the Manhattan Company was founded by Aaron Burr in 1799 with the initial goal of supplying water to the lower Manhattan area. It was headed by David Rockefeller during the 1970s and 1980s when it became known as one of the country’s most prestigious financial institutions. The real estate collapse in the 1990s, however, weakened the company and Chemical Bank acquired it in 1996. Chemical Bank retained the name “Chase” in the combined company. Chase Manhattan Bank merged with J.P. Morgan in 2000 to form JPMorgan Chase & Co. In the late 1990s, J.P. Morgan emerged as one of the United States largest banks, owing to its dominance in debt and equity securities underwriting. However, the bank lacked a strong position in commercial and investment banking. In 1998, the bank made public its intentions of merging with another bank to expand its list of offered services. Some of the potential candidates for the merger included Credit Suisse, Deutsche Bank AG, Goldman Sachs, and Chase Manhattan. In 2000, Chase Manhattan also announced that it was looking to merge with a US bank in a bid to strengthen its investment banking business. J.P. Morgan and Chase Manhattan Bank agreed to a merger, and the two companies formed JPMorgan Chase and Co. Through the new company, both banks strengthened their service offerings and added more services such as investment banking, retail banking, asset management, commercial banking, private banking, and private equity. The consumer and community banking division provides services to its clients through its branches, ATMs, online, mobile, and telephone banking. The division works through its three segments, consumer and business banking, mortgage banking, and card, commerce solutions, and auto. The consumer and business banking segment offers deposit, investment products and services to consumers, and cash management, deposit, and payment solutions to small and medium enterprises. The mortgage banking division provides residential mortgages, home equity loans, and mortgage servicing. The card, commerce solutions, and auto segment issues credit cards, merchant payment solutions, auto loans and leases, and student loans. The corporate and investment bank division provides a range of investment banking, market making, prime brokerage, treasury and securities products, and other services to global corporations, governments, financial institutions, municipalities, and individual investors. The services are offered through the banking and the market and investor services segments of this division. Banking entails advising investors on corporate strategy and structure, capital raising in equity and debt markets, treasury services, loan origination and servicing, as well as a range of investment products and services. Market and investor services comprise risk management solutions, prime brokerage, securities services, and securities lending products for asset managers and investment funds. The commercial banking division provides financial solutions such as treasury services, asset management, and investment banking. It also provides financing to real estate investors and property owners. The division includes specialists and financial experts who offer industry knowledge to financial institutions, non-profit organizations, multinational corporations, and governments. The asset and wealth management division offers investment management across different asset classes such as equities, money market funds, and fixed income. For clients with multi-asset investment needs, the division provides solutions to clients’ investment needs. Other services offered in this division include retirement planning, brokerage, and banking services. The typical clients for this division comprise high-to-ultra high net worth investors, institutions, and retail investors.